When the UK government gave the final approval for Hinkley Point C in September this year, people could have been forgiven for thinking that a new generation of nuclear reactors was a done deal for the UK. The decision having been made, everyone now seems content to sit and wait for EDF to complete construction and deliver the finished plant, sometime in the middle of the next decade. Few have noticed what is going on with EDF at the moment and there has been little comment about whether they will succeed in delivering the plant at all, never mind on time and on budget. Hinkley Point C is to be a European Pressurised Reactor (EPR), which is a new iteration of an established reactor technology. Work on the prototype EPR at Flamanville in France began in 2007, but the project is now 6 years behind schedule and €7 billion over budget. And there is still no definitive delivery date due to technical problems that have been uncovered with the installation. In 2014 the French nuclear regulator the Autorité de Sûreté Nucléaire (ASN) discovered that quality control documents concerning certain parts installed at the plant had been falsified and that the steel parts used in the pressure vessel contained excess carbon. This matters because a high carbon content can cause the steel to become brittle, increasing the risk of failure. The maximum allowable carbon content of steel in the pressure vessel is 0.22%, but tests have shown 0.30% in parts of the Flamanville vessel. 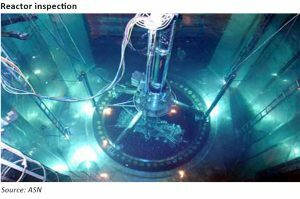 These findings mean that ASN has been unable to issue a Certificate of Conformity for the plant, meaning it doesn’t comply with the European Directive on Pressure Equipment which requires any new nuclear reactor coolant circuit component to have a Certificate of Conformity before production commences. 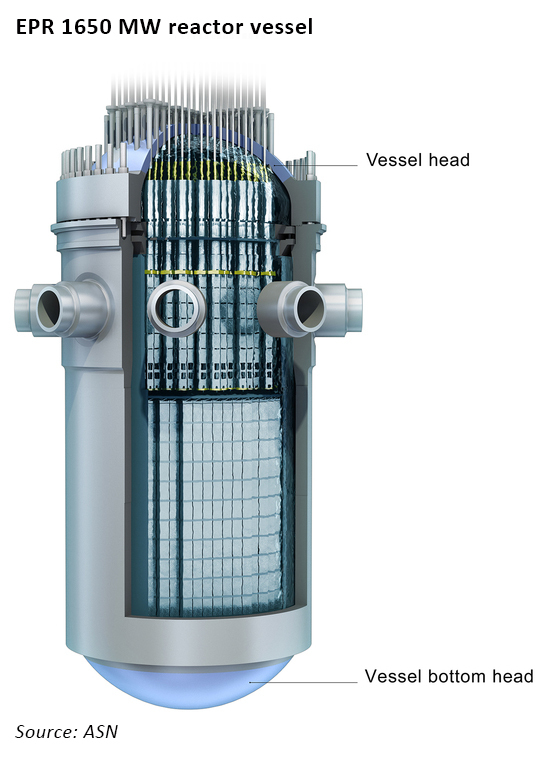 The upper and bottom heads of the reactor pressure vessel for at Flamanville were manufactured at Areva’s Le Creusot facility in September 2006 and January 2007, respectively. The discovery of a high carbon content in those parts prompted Areva to review the company’s quality management process in 2015 for some 400 heavy steel components made at the Creusot Forge since 1965. The problems at Flamanville led the ASN to ask Areva and EDF to see whether any components in EDF’s in-service nuclear plants were affected by a similar problem, including parts made by Japan Casting and Forging Corporation (JCFC). In June, ASN reported that it had identified 18 reactors whose steam generators could contain high carbon concentrations. Of these, 12 are equipped with channel heads manufactured by JCFC “liable to contain a particularly high carbon concentration”. Areva has been instructed to examine the files of all equipment manufactured at Creusot in order to determine the full extent of the carbon issues and whether any other quality deviations occurred. This review is expected to take a year. Of the 87 irregularities identified in the first phase of the audit, ASN concluded that most have no safety implications, although more serious issues were found in the steam generators at Bugey 4 and Fessenheim 2 (which has its test certificate suspended) and the new steam generator manufactured but not yet installed at Gravelines 5. The results of the investigations to date suggest that while many of the reactors are affected by pressure vessel components that do not meet the required standards, the operational impact is not serious. It is clear that the excess carbon issues date back many years, decades even, but have not resulted in any actual failures of the affected components. This may be due to large margins of error in the safety specifications, but it poses some questions for ASN in relation to Flamanville – it’s one thing to allow in-service reactors to continue in use, perhaps with a more rigorous inspection regime, it’s quite another to permit a new unit with known flaws to enter service. The regulator will need to decide what actions need to be taken by EDF in order that a Certificate of Conformity can be issued – relaxing the requirements risks undermining the regulatory regime, but requiring the pressure vessel to be replaced would be very expensive and add further serious delays to the project. What is the impact on the UK? The issues with the French nuclear fleet have a number of implications for the UK. “So long as France can continue to export up to 2GW to the UK during peak demand periods the nuclear plant shutdowns should not cause further deterioration in the UK reserve margin this winter. The problem, however, is that a cold spell could cause power flows from France to UK to dry up altogether. There have been occasions in the past where power flows from France to UK were in fact reversed during such cold spells even when no significant number of French nuclear plants were off line…. In terms of the UK’s current and planned nuclear fleet, the issues at Flamanville may have a wider impact. Although it seems that EDF’s UK reactors are not affected by the Le Cruesot scandal (the Office for Nuclear regulation specifically sought confirmation of this before approving Sizewell B’s return from summer maintenance), there is an implication for Hinkley Point C.
The ASN is understandably focusing its attention on issues with EDF’s in-service reactors, and it’s likely that work relating to Flamanville will be de-prioritised as a result. Timing for Flamanville matters since the UK Credit Guarantee for Hinkley Point C will lapse if Flamanville isn’t operational by the end of 2020. A further concern relates to the financial impact on EDF. The massive reduction in nuclear availability since ASN’s investigations began together with the possibility of having to replace the pressure vessel at Flamanville are increasing the financial stress on the company, which has seen its credit rating cut three times this year. While the French government may well find some way of bailing out EDF’s French operations, it is doubtful that it would be willing to extend support to non-French projects such as Hinkley. Against this backdrop EDF has just launched the second phase of its consultations for Sizewell C. It’s hard to see that project getting far before all the other issues facing EDF are resolved. The UK should keep a close eye on developments across the Channel to make sure current and future capacity margins are defended and security of supply is not undermined by the French nuclear problem.